You'reOnTime has a wide range of reports to view your business performance from every possible different angle, so it can sometimes be hard to know where to start. 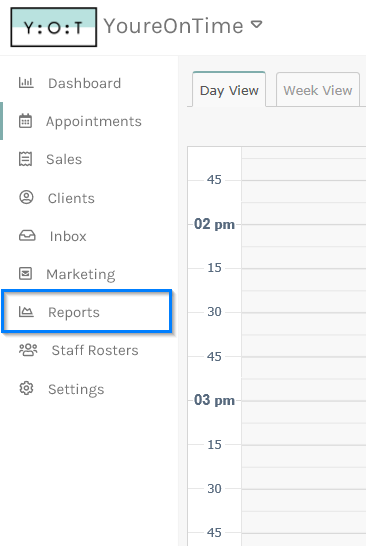 We have listed the top 5 reports you should run regularly to get going. You can access all these reports in the Reports screen from the side menu. The Payments List report will show actual money coming into your business. It will list all cash, credit card, debit card or cheque payment, showing exactly how much money you are banking. It will exclude payments made on account or gift voucher. For small businesses running mostly on cash this will give you the best understanding how much money you made. The sales list will list every product and service sold by your business for a period. If you want a complete list of everything you did then this report is for you. As this report will include services purchased via a gift certificate or account where money may not have changed hands, the totals from this report may differ from the Payments List report. As a bonus, if you enter the end date as a time in the future this report will estimate your future earnings. Business growth is not just about getting new clients but client retention. It is one of the most important metrics for measuring business health. By selecting a period of time and then choosing a return time, ie 6 weeks, you can see how many clients are coming back and which staff are getting the best return business. The Staff Performance report will show you a summary of all services performed, how much revenue they generated, appointments and hours worked all broken down by staff. The Weekly Performance Summary will show you a summary of Appointments, Sales, Online Bookings and New Clients for each week over a period of time. By choosing a period of time such as the last 6 months you can at a glance spot any trends. Online Bookings are an easy way to boost business. Many people prefer the convenience of booking online. The Online Bookings Summary will tell you how many online bookings you are gettings over time, how many of them are cancelling and what percentage online bookings make up of your overall business.